Leipzig: RB to expand Red Bull Arena by 10,000? The former Zentralstadion, currently Red Bull Arena, is only 10 years old, but may already be facing major changes. Second league RB Leipzig are hoping to go through to the Bundesliga and reaching full potential there may require stadium expansion. It’s entirely possible all works may be carried out under the existing roof, because Red Bull Arena has some space left for additional seats. These would be installed primarily between current lower tier and the pitch, but also behind both goals, where there’s no upper deck at the moment. Altogether over 10,000 seats could be added. It’s not certain at this point when construction could start. 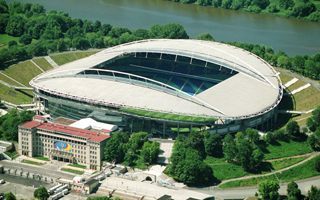 It’s expected to be financed by Red Bull owner Dietrich Mateschitz, who would also most likely buy the stadium from the city. Works can be carried out during regular football use.